The first step to creating your mood board is to collect various images. These images could be hosted on a variety of platforms like your computer, the web, social media accounts like Pinterest, Flickr or Picasa. SampleBoard allows you to import from these platforms so that all your images are saved in one place. But today I’ll be discussing how to use the search the web functionality to your advantage when sharing your vision with clients. Like you would search images within Google Image, so you would search for images within the editor using our new search the web feature. Often an overlooked step when creating a mood board, I believe it’s an important step to create a list of keywords that describe the look and feel you would like to portray. I would recommend starting with 3 to 5 words that you believe to accurately reflect your vision. Whether you pick mid century modern, retro, purple flowers, modern furniture, 1950’s design or any other descriptive word  start with a keyword search. 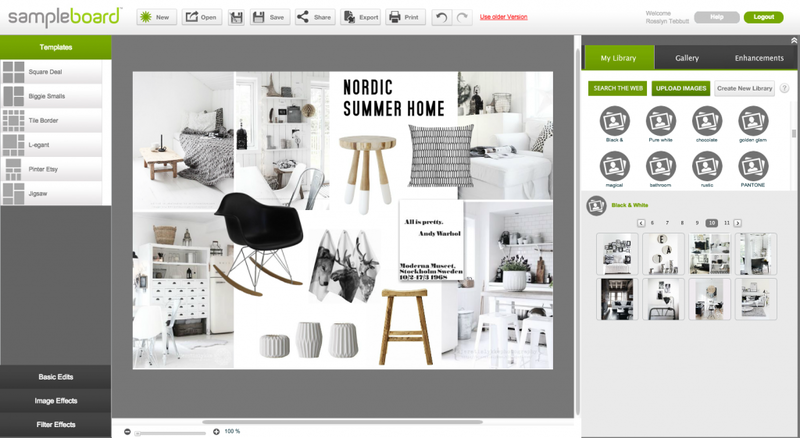 As you find the images that inspire you, save them to your SampleBoard library easily by clicking the (+) button. No need to save the link to the original work, we take care of that! Don’t have a SampleBoard account? signup for your free trial here.